NGW had the opportunity to meet Carmen Lopez- Contreras during the LNG conference in October in London. Charles Ellinas asked her about how spot prices differ from short term in a volatile and seasonal market. NGW: You have said that 80% of LNG trade is still done under long term commitments despite the recent increase of a secondary market allowing for shorter deals. Can you elaborate on current trends, especially within the context of market volatility and a perceived oversupply of LNG? Carmen Lopez-Contreras → The vast majority of LNG contracts are for at least one year’s duration. And volumes bought directly from liquefaction projects are overwhelmingly signed at least for 20 years to allow for project financing. What has changed in the market is the development of a secondary market that allows for shorter-term contracts. Usually big companies sign the primary contracts with their liquefaction partners and then ‘resell’ some of these volumes to buyers that do not want to bear the risk of a 20-year contract or whose demand is difficult to predict for several reasons, such as government policies, their own production, and so on. These portfolios have helped the development of pure spot volume trading that was quite small before the Fukushima disaster in March 2011 (Figure 1). NGW: Where are spot LNG volumes coming from and where are they going? - Equity volumes from those big players and portfolios that have some equity rights at liquefaction plants; but also some regasification capacity or capacity booked at importing terminals. That way they can move volumes from one place to another depending on price signals. One example is Qatar or other portfolio players such as Shell. - Idle volumes from some plants that project partners decide to leave for the spot and short-term market, either voluntarily – like some volumes at the Australian Northwest Shelf project – or not: such as Angola LNG, which was originally conceived for regasification in the US. But spot volumes are still a small part of global LNG trade and liquidity is very thin. NGW: In the case of the US, how are prices evolving and how are off-takers responding to price signals? Carmen Lopez-Contreras → US LNG has changed the market because it is providing more flexibility, by sending cargoes in response to price signals, but also upstream flexibility in the sense that gas can be sourced from the grid (a full liquid market) and tolling partners can also decide whether or not to liquefy the gas. At the time final investment decisions (FIDs) were taken, price differentials between basins provided a good business case. But when oil prices fell, at the end of 2014, the gap closed up and FIDs were shelved for some time. Since the summer, with the rise in oil prices, US LNG projects are again showing positive margins which encourages new FIDs (Figure 2). Unfortunately in the last few weeks, low inventories in the US have sent Henry Hub prices to very high levels (about $4.5/mn Btu) and some US LNG cargoes may struggle to find their home. Off-takers of US LNG have more commercial flexibility which allows them to respond quickly to price signals and send volumes where they are needed, therefore expanding the spot market. NGW: How do LNG spot prices compare with other price references and what is the effect of seasonality and tight periods? Carmen Lopez-Contreras → Spot LNG prices, those finally accepted by receiving countries or final buyers, are influenced by other price references in different regions: oil, gas, coal and carbon prices. As regions compete to attract spot volumes, especially in the high demand regions of Asia and Europe in the northern hemisphere – caused by heating demand during winter and cooling during summer – spot prices tend to fluctuate in a wide range set by European hub prices as the floor and oil-linked references as the ceiling (Figure 3). During tight periods, the lack of liquidity, but also shipping, sets buying spot prices above market expectations as buyers compete to attract cargoes. NGW: You have said that Asia is the main demand region. How are prices set there and what are the factors affecting them? Carmen Lopez-Contreras → Asia is the main LNG demand region and spot prices fluctuate in a range between a floor set by European gas prices (TTF) and a ceiling set by reference to oil. In Asia, spot prices are still highly influenced by oil prices (Figure 4) as historically the main demand countries, such as Japan or Korea, switched consumption away from oil products (diesel) and bought LNG linked to Japanese crude prices. But they are also influenced by European fundamentals as they compete to attract cargoes. LNG spot prices in Asia rise with demand growth, but also in response to some one-off effects such as weather and nuclear plant availability, the push of oil and gas prices – and even carbon prices in Europe. NGW: How is Europe featuring in this and what is the impact of carbon pricing? Carmen Lopez-Contreras → In northwest Europe – the Iberian Peninsula still has different and individual fundamentals – where the gas markets are highly flexible and liquid, LNG cargoes arrive when price signals are correct and there is availability in the global gas market. These markets have recently followed the trend in coal thanks to the capacity to switch between fuels for power generation. Recently carbon prices have also pushed up coal-fired power costs, but also gas, feeding into higher gas prices (Figure 5). In Europe, oil still has an influence, but it is somewhat diluted, as there has been a major shift to TTF hub prices in long-term pipe contracts. NGW: Looking forward, how do you see spot LNG prices evolving? 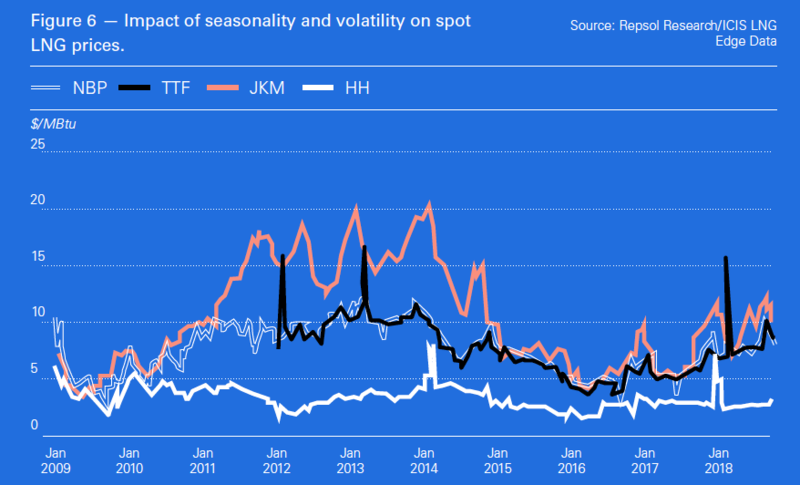 Carmen Lopez-Contreras → Trying to guess how spot price references will look like is almost impossible but some things are certain – the impact of seasonality and volatility (Figure 6). On the one hand, the LNG market is facing increasing seasonality as China’s push for cargoes is exacerbating Asian winter demand. But at the same time the diminishing domestic production in Europe together with reduced storage is also creating peak prices during the winter months. On the other hand, the market is experiencing more volatility and some short-lived price spikes. Very flexible demand like that for power to back-up renewables create uncertainty in the market and prices tend to behave more based on expectations. Volatility can also be caused by abnormal weather conditions. NGW: There is often talk about commoditisation of LNG. 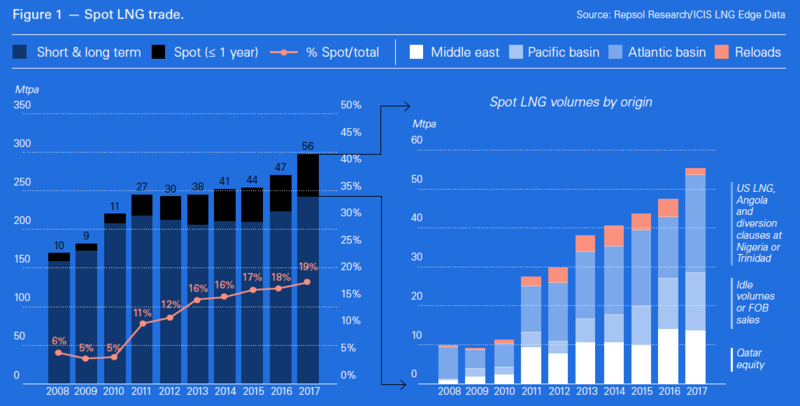 Do you see a global spot LNG price evolving, how and by when? Carmen Lopez-Contreras → We need to keep in mind two things when talking about commoditisation. One is the nature of LNG: it is a way to transport energy (gas) and therefore – unless LNG as a fuel develops widely – it is not consumed in the same way as other commodities such as oil, coal or pipeline gas. The other is that the LNG market is a small one, representing about 11% of global consumption (based on BP statistical data). 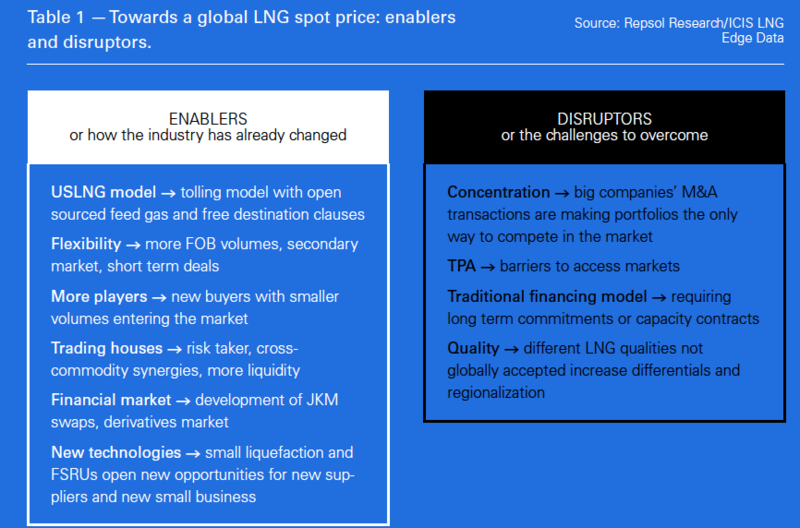 With these two factors in mind, it is going to be difficult to have a spot LNG price anytime soon. May be if Asian gas demand keeps increasing at such healthy percentages as today and LNG keeps representing the main alternative to meet that demand, then an LNG spot price could develop first in Asia. In the longer term, the development of a liquid spot LNG price, which serves as a unique price reference in the market could be used to underpin investments and hedge price risks. It could also become the enabler of new gas uses, such as LNG for bunkering or road transportation. NGW: What are the key enablers and disruptors? Carmen Lopez-Contreras → Certain things have improved towards a more liquid market that could enable the creation or adoption of a spot LNG price. Some clear examples are the increase of US FOB volumes, the development of a secondary market, the entry of trading houses in the play or the development of new technologies like small liquefaction or floating storage and regasification units (FSRUs). But there are still some hurdles to overcome: the recent consolidation of LNG businesses by some big companies will not help to enhance competition; nor will the lack of third-party access at some regasification terminals. The traditional financing model for LNG projects that makes long-term commitments unavoidable also prevents further development of a secondary market. Gas quality is a minor issue but it crops up at times of peak demand as the availability of supply options is reduced for certain buyers. And for me one of the most important hurdles is transparency. Unless we start educating ourselves about the need to have transparent price signals we will not be able to develop a liquid market for LNG. NGW: What are your key take-aways in terms of where the LNG market is heading? Despite the recent trends in contracting towards flexibility and shorter terms, the spot market is still a small percentage of global LNG trade. A single LNG spot price reference is still not here and it will probably take time to develop.